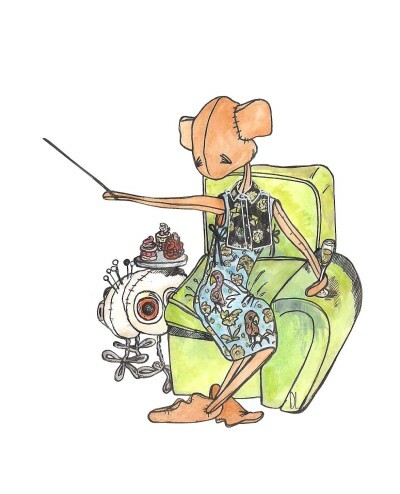 Most of you will know me, but for the uninitiated, uninformed and ignorant I am Maude, fictional fabric fashion mouse , fashion icon and Editor-in-Chief of MAUDEZINE , I was created out of Savile Row cashmere suiting by David Longshaw when he was studying fashion at St martins. I have appeared in everything from Vogue, to the London Fashion week newspaper and far too many publications to mention, I have even been exhibited in Sotheby’s. In this section (and throughout the David Longshaw website) you will be introduced to my MAUDEZINE editorial team, including my boozy side kick and chief photographer Doris; my powder pink pet Pertinence; Mildred (the peculiar penguin who sees people as dresses) Agony Aunt for MAUDEZINE, right through to our interns – Percy’s (we call all our interns Percy as we can’t be bothered to learn their names). You will also meet my good ‘friend’ Francesca & Arthur (Francesca’s sheep/dog- half sheep- half dog) who David initially created for VOGUE Italia (and used for his weekly online comic strip for them). Editor-in-Chief of MAUDEZINE and fashion icon.